Nintendo developed its MMC chip line for use in the NES's cartridges to offload processing and expand the system's capabilities. Multi-memory controllers or memory management controllers (MMC) are different kinds of special chips designed by various video game developers for use in Nintendo Entertainment System (NES) cartridges. These chips extend the capabilities of the original console and make it possible to create NES games with features the original console cannot offer alone. These chips are also known as mappers. A Tetris cartridge showing an MMC1B1 chip. Games used in: The Legend of Zelda, Mega Man 2, Metroid, Godzilla: Monster of Monsters, Teenage Mutant Ninja Turtles, and more. The MMC1 is Nintendo's first custom MMC integrated circuit to incorporate support for saved games and multi-directional scrolling configurations. :p.30 The chip comes in at least five different versions: MMC1A, MMC1B1, MMC1B2, MMC1B3 and MMC1C. The differences between the different versions are slight, mostly owing to savegame memory protection behavior. The MMC1 chip allows for switching of different memory banks. Program ROM can be selected in 16KB or 32KB chunks, and character ROM can be selected in 4KB or 8KB chunks. An unusual feature of this memory controller is that its input is serial, rather than parallel, so 5 sequential writes (with bit shifting) are needed to send a command to the circuit. Games used in: Mike Tyson's Punch-Out!! The MMC2 is only used in Mike Tyson's Punch-Out!! and the later rerelease which replaced Mike Tyson. A single 8KB bank of program ROM can be selected (with the remaining 24KB locked) and character ROM can be selected in two pairs of 4KB banks, which would be automatically switched when the video hardware attempts to load particular graphic tiles from memory, thus allowing a larger amount of graphics to be used on the screen without the need for the game itself to manually switch them. The MMC3 chip, soldered onto a PCB containing Super Mario Bros. 3 and others. Games used in: Mega Man 3, 4, 5, 6, Super Mario Bros. 2NA/EU, Super Mario Bros. 3, Kirby's Adventure, and more. 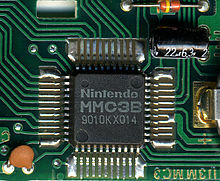 The MMC3 is Nintendo's most popular MMC chip. It comes in MMC3A, B, and C revisions. The MMC3 adds a scanline based IRQ counter to make split screen scrolling easier to perform (mainly to allow the playfield to scroll while the status bar remains motionless at the top or bottom of the screen), along with two selectable 8KB program ROM banks and two 2KB+four 1KB selectable character ROM banks. This chip is only used in three games, all of which were released only for the Famicom in Japan, and were developed by Intelligent Systems. Functionally, it is nearly identical to the MMC2, with the only difference being that the MMC4 switches program ROM in 16KB banks instead of 8KB banks and has support for a battery-backed SRAM to save game data. The MMC5 is Nintendo's largest MMC. It was originally also the most expensive. Only Koei used this chip regularly. The chip has 1 KB of extra RAM, two extra square wave sound channels, one extra PCM sound channel, support for vertical split screen scrolling, improved graphics capabilities (making 16,384 different tiles available per screen rather than only 256, and allowing each individual 8x8-pixel background tile to have its own color assignment instead of being restricted to one color set per 2x2 tile group), highly configurable program ROM and character ROM bank switching, and a scanline-based IRQ counter. The MMC6 is similar to the MMC3, with an additional 1 KB of RAM which can be saved with battery backup. Games used in: Akumajo Dracula, Arumana no Kiseki, Ai Senshi Nicol, Big Challenge! Dogfight Spirit, Bio Miracle Bokutte Upa, CrackoutJP, Double DribbleJP, Dracula II, Falsion, Famicom Tantei Club Part II: Ushiro ni Tatsu Shōjo, Kid IcarusJP, KiKi KaiKai, Meikyuu Jiin Dababa, MetroidJP, Pro WrestlingJP, Relics - Ankoku Yousai, Risa no Yōsei Densetsu, Shin Onigashima, Super Mario Bros. 2JP, The Legend of Zelda (FDS release), The Mysterious Murasame Castle, Vs. Excitebike, Yūyūki, Zelda II: The Adventure of LinkJP, and more. The Famicom Disk System's ASIC is an extended audio chip, which supports one channel of single-cycle (6-bit × 64 step) wavetable-lookup synthesis with a built in phase modulator (PM) for sound generation similar to frequency modulation synthesis. Games used in: Battletoads, Wizards & Warriors, Cobra Triangle, Jeopardy! The A*ROM MMC, named after the AMROM, ANROM, and AOROM cartridge boards that use it, was developed by Chris Stamper of Rare, and manufactured by Nintendo. It is found in games developed by Rare for Nintendo, Tradewest, GameTek, Acclaim, and Milton Bradley. It uses 32 KB ROM switch and a CHR RAM. Unlike other chips, it uses one screen mirroring. As Nintendo's NES licensing program allowed North America and Europe distribution to include only first-party hardware in its cartridges, these third party chips were supposed to be used only in Japan. However, some of them had been found in a few North American cartridges as well. The VRC2 is a chip from Konami that allows program ROM to be switched in 8KB banks, and character ROM to be switched in 1KB banks. This MMC has two known revisions: VRC2a and VRC2b. Exclusively used in the Japanese version of Salamander. The VRC6 (Virtual Rom Controller) is an advanced MMC chip from Konami, supporting bank switching for both program code and graphics as well as a CPU cycle–based IRQ counter, which can also act as a scanline counter. The chip also contains support for three extra sound channels (two square waves of eight duty cycles each, and one sawtooth wave). 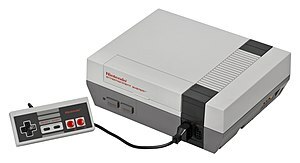 It is used in Akumajō Densetsu (the Japanese version of Castlevania III: Dracula's Curse), while the Western version uses the MMC5 from Nintendo. Since the Nintendo Entertainment System does not allow cartridges to add additional sound channels, the Famicom version's soundtrack was reworked to follow those specifications; thus, the soundtrack on the Western version is implemented by the five sound channels built into the stock NES. The VRC7 is a very advanced MMC chip from Konami, not only supporting bank switching and IRQ counting equivalent to the VRC6 but also containing a YM2413 derivative providing 6 channels of FM Synthesis audio. This advanced audio is used only in the Famicom game Lagrange Point; while the Japanese version of Tiny Toon Adventures 2 also used the VRC7, it does not make use of the extended audio. The 163 has been only used in games exclusive to Japan. Its capabilities were a little better than Nintendo's MMC3. A variant contained extra sound hardware that plays 4-bit wave samples. It supports 1 to 8 extra sound channels, but audible aliasing appears when a sufficiently large number of channels are enabled. Games used in: Batman: Return of the Joker, Hebereke, Gimmick!, and more. The FME-7 is a memory mapping circuit developed by Sunsoft for use in NES and Famicom cartridges. It switches program ROM in 8KB banks and switches the character ROM 1KB banks. It also contains hardware to generate IRQ signals after a specified number of CPU clock cycles, thus achieving split-screen effects with minimal use of processing power. A special version of this MMC, labeled as "SUNSOFT 5B" rather than "FME-7", contains a version of the widely used Yamaha YM2149. This sound generation hardware is used on only one Famicom title: Gimmick!. Some individual (homebrew) and unlicensed developers have made custom MMCs for the NES, most of which simply expand the available memory. 228 is a simple bank switching MMC developed for use in the games Action 52 and Cheetahmen II. It does not have a nametable control bit. In the Action 52 multicart, it also contains a small 16-bit register area that contains the old menu selection when exiting a game. ^ a b c d e "Why Game Paks Never Forget". Nintendo Power. Nintendo (20): 28–31. March – April 1991. ^ UxROM from NESdevWiki Retrieved on 2009-11-21. ^ MMC1 from NESdevWiki Retrieved on 2009-11-21. ^ "VRC1 - Nesdev wiki". wiki.nesdev.com. Retrieved 18 January 2017. ^ "Mednafen Nintendo Entertainment System/Famicom Documentation". mednafen.github.io. Retrieved 18 January 2017. ^ D'Angelo, David (25 June 2014). "Breaking the NES for Shovel Knight". Gamasutra. This page was last edited on 19 April 2019, at 04:46 (UTC).